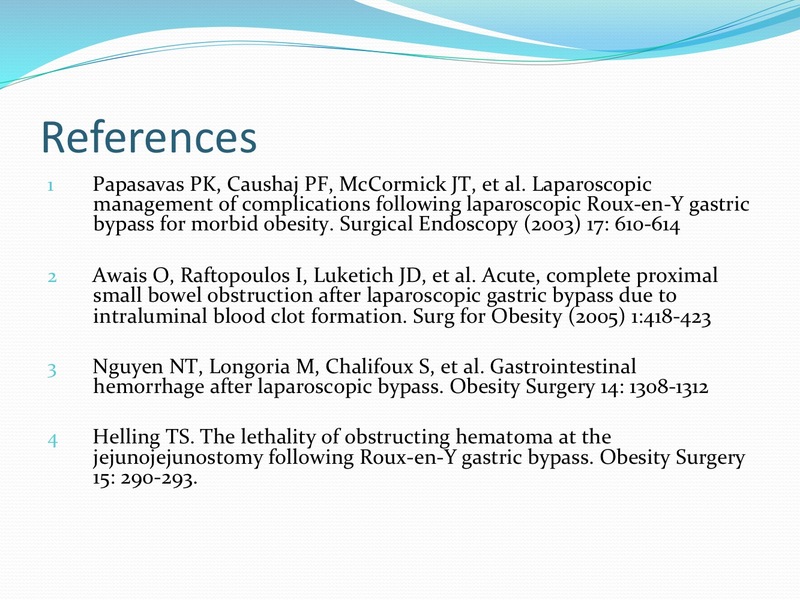 Background: Laparoscopic Roux-en-Y gastric (RYGB) bypass is the most common Bariatric procedure performed in the US. Postoperative gastrointestinal bleeding occurs in approximately 1% of all procedures. We report our experience with the rare complication of intraluminal gastrointestinal hemorrhage leading to an obstructing intraluminal blood clot at the jejunojejunostomy (JJ) following RYGB. Methods: Two cases of laparoscopic RYGB performed at separate institutions by different surgeons were reviewed. The patient demographics, signs and symptoms, day of presentation, diagnostic imaging, laboratory work, operative findings and perioperative sequelae were compared. Results: Both patients were women, 46 and 49 years old with BMI’s of 42.3 and 39.7 kgm-2, respectively. Onset of symptoms was on post-operative day (POD) #2. Bilous vomiting, abdominal pain, and tachycardia were present in both patients. Patient 1 was an inpatient when her symptoms developed. An emergent laparotomy revealed a distended biliopancreatic limb and remnant stomach, and a leak at the JJ anastamotic site due to increased intraluminal pressure from the obstructing clot. No active bleeding was found when the anastamosis was examined. Patient 2 had been discharged on POD #1. At the time of exploratory laparoscopy, an obstructing JJ clot was found but no evidence of a leak. Patient 1 developed complications due to an aspiration pneumonia. This led to systemic sepsis, hemodynamic decompensation, and she subsequently expired on POD # 7. Patient 2 also aspirated, leading to pneumonia with prolonged ventilation requiring tracheostomy. She was adequately treated with a course of antibiotics, improved, and was discharged to a LTAC facility on POD # 26. She has recovered well and has a BMI of 25 kgm-2 six months after surgery. Conclusion: Obstructing intraluminal blood clot at the JJ following laparoscopic RYGB can have devastating consequences. Bleeding from the staple line and DVT prophylaxis are probable etiologies. An extensive English literature search revealed that this is a rarely reported cause of obstruction at the JJ. Similarities in these two patient demographics and presentation should prompt more research and possibly a revision of risk stratification for DVT prophylaxis.